Wire Transfer is quite simple to use as it is based on electronic money transfers where the funds are moved from the bank account of the sender (i.e. the player in this instance) to the bank account of the recipient (the respective online casino). This method is widely accepted by an imposing number of online casinos offering the game of roulette. Playing online roulette for real money has a number of perks to offer from a broader range of variations and an increased level of convenience through flexible table spreads allowing both recreational players and professionals to join the action. Online roulette has the potential to give fans of the game more value for the money they put on stake as web-based casinos run a much broader spectrum of appealing promotional incentives. The games typically offer a variety of customisation options so that players can tailor their gameplay in accordance with their personal style of play, pace, and preferences. With an increasing number of roulette players dropping the noisy landbased gambling floors for interactive gaming, the demand for secure payment solutions is also on the rise. The good news is there are plenty of efficient and simple methods you can use to top up your roulette balance to start betting on your lucky numbers or combinations. One such method is online banking, which is also commonly referred to as internet banking, e-banking or online bill pay. Processing a deposit at your web-based casino of choice via online banking is in fact easy as pie. However, you do need to hold an account with a banking institution in order to use the method. If you do not, do your homework and visit different banks to enquire about what types of accounts they offer and what charges apply to the transactions. Once you have made an informed decision as to which bank is most suitable for you, you can proceed to open an account – the process is quick and fuss-free as you only need to show a proof of residence and a valid identification document. Make sure you sign up for your bank’s online banking service. Otherwise, you will be unable to make borderless transactions via online banking. Some banks would allow you to fill in the application form for their online banking services directly on their websites while others would require you to visit their local branches in person. When you open your online banking account, you are all set to make your first deposit with the method. There are several ways to go about this. Your first option would be to log into your bank’s online banking portal with your unique user ID and password (or ATM PIN) and follow the instructions on the screen to execute the payment. A growing number of roulette enthusiasts prefer to use the services of third-party online banking processors. The latter only act as “middlemen” between players’ banks and the banks of the interactive casinos. This allows for an increased level of privacy and security. Some of the online banking processors that are commonly supported by online casinos include Nordea, InstaDebit, iDebit, Citadel, and Trustly. The only condition you need to meet is to have an online banking account with one of the banks associated with the respective payment processor. You will be able to read more comprehensive information on both procedures in the sections to follow. Boosting your online roulette balance is quite easy with online banking. If you decide to use your bank’s online banking service, you first need to log into your account with your user ID and password and then click on the option that allows you to initiate a payment. The service is usually worded as “online bill pay” or something of the kind. If you fail to find one such service, your financial institution probably does not offer it and you will have to look for an alternative deposit option. Then, you need to input some details like the date on which you wish the payment to be transferred, the business’ name (the online casino), the number of its bank account, the bank’s routing number (usually an eight-digit code), and a payment reference (often your username at the casino). You may need to provide the name of your bank along with the address as this helps banking institutions to verify the codes are correct. Things are not much different when you decide to resort to the services of a third-party payment processor like iDebit and InstaDebit, for example. The procedure is roughly the same but this time you sign into your online casino account and select your preferred payment processor from the cashier menu, if available. Then you select your bank from the drop-down menu with supported banking institutions and are redirected to its log-in page where you must enter your online banking credentials. Once you sign into your online banking page, you need to confirm the transaction and that is all – the money will be transferred to your online casino balance within moments. The only shortcoming of using the services of third-party online banking processors is that some casinos do not return withdrawals via these methods. If so, players who have deposited this way have to cash out their winnings via cheques or bank transfers. On the whole, online banking is considered a safe way to top up your casino balance and play for real money as licensed gambling operators are required by their regulators to encode their players’ payments with SSL encryptions to keep sensitive information out of scammers’ reach. In most instances, either 128-bit or 256-bit SSL encryptions are adopted. The same security technology is, in fact, used by all major banking institutions in the world, yours included. 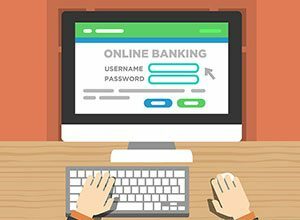 If you are depositing directly from your personal online banking account, there are a few things you can do to add an extra layer of security to your online gambling activities. Scammers usually resort to phishing emails where they pretend to be representatives of existing companies or even banks. Avoid opening suspicious emails. Under no circumstances should you click on the links they contain as these aim at taking you to fake websites so they can steal your online banking details. Another good idea would be to keep track of your online banking log-in history in the portal and change the password once in a while. Using the services of third-party payment processors based on online banking is a safe option for online roulette players. It helps them deposit to their casino accounts anonymously. They are not disclosing any banking information to the casino itself because they are redirected to their banks’ online banking portals. In other words, all details concerning the transactions remain secure between the roulette player and their financial institution – the payment company only assumes the role of an intermediary between these two parties. Another pressing question many online roulette novices are burning to find answers to has to do with the fees imposed on their online-banking transactions. Payments processed via internet banking may involve some charges but these rarely are on behalf of the online gambling operators. Almost all highly-regarded web-based casinos process online banking deposits at the no extra cost for their players. Whenever fees apply, these are usually listed in the cashier menu clearly and transparently so that all customers can see. That being said, you may want to check the website of the financial institution whose online banking platform you use and look up their policies. Your bank may charge a fee for the electronic transactions you initiate to your preferred online casino. Of course, since each bank has its own policies, the fees would differ from one banking institution to another. If you cannot find your way around the bank’s website, we recommend you visit its local branch in person or call on the phone to request additional information on the fees. The deposit and withdrawal limits vary depending on which online casino you have registered with. These are generally listed on the casino’s banking page where you can check and compare the minimum and maximum limits for bank transfers and online payment services like Nordea, InstaDebit, and iDebit, among others. The increasing number of players insisting on betting while on the move has caused more and more gambling operators to optimise their websites for mobile play. Some casinos offer native mobile applications for iOS and Android but many have already embraced the latest technological trends and run HTML5-based websites which can be accessed by a massive range of portable devices, no matter the operating system they are running on. This results in an increased demand for mobile-friendly methods of banking, enabling roulette fans to conveniently deposit and withdraw on the go. The internet banking portals of most major financial institutions are compatible with smartphones and tablets. All players have to do is enter the portal’s address in their browsers and they will be immediately redirected to the mobile version of the log-in online banking page. Online payment companies are also ahead of the curve, providing their customers with the opportunity to initiate transactions on their smartphones. Roulette players looking to top up their balance while on the go can do so via payment processors like Trustly, InstaDebit, iDebit, and Nordea, among others. These either offer mobile-friendly websites or have developed their own dedicated downloadable apps. Internet banking has a huge number of perks to offer to online roulette players. First off, this method is extremely popular and as such is accepted by most web-based gambling operators. Anyone can use it as long as they have an online banking account. Internet banking is also considered one of the safest ways to transfer funds between accounts since the player is not actually required to disclose any sensitive information to third parties, or in this case their favourite online casino. This reduces the chances of one’s personal and banking details leaking onto the internet. The details concerning the transactions always remain safe between the player and their bank. Furthermore, online banking is deemed a very cost-effective way to boost your online roulette balance. Online casinos rarely charge fees on these transactions. If some fees on behalf of your bank or payment processor apply, these typically are lower than the charges involved when using a digital wallet, for example. So if you are looking to extract more value from your betting sessions and extend your gaming budget, online banking can prove to be a suitable alternative for you. Last but not least, the upper limits on transactions carried out this way are often higher which renders this payment solution perfect for brave bettors and high rollers. While the positives of funding your casino account via online banking outnumber the negatives, the method is not entirely devoid of flaws. One of the biggest setbacks is that sometimes the money transfers you initiate via your bank’s online banking portal require a little more time to complete and are not immediate. The funds may reach the player’s casino balance several business days after their deposit has been initiated. On the positive side of things, these delays may prevent you from spending more than you can afford at the virtual roulette tables. However, if you resort to using the services of third-party intermediary processors like InstaDebit, Nordea and Trustly, your deposits will be executed immediately. If you oppose the idea of using your personal online banking account for the purpose of playing virtual roulette for real money, you can take advantage of the services of third-party mediators. Such payment service companies enable casino players to gamble from the comfort of their surrounding completely anonymously without sharing any of their financial details to iGaming operators. There are many different intermediaries whose services you can use to deposit. Some of these are available locally to players from certain jurisdictions as they work with local banking institutions only. We elaborate on five of the most popular online banking intermediaries below, so read on to learn more. Launched in 2003, InstaDebit provides roulette fans with a secure, easy-to-handle, and anonymous platform they can use to top up their casino balance directly from their personal bank accounts. Many players favour it over other similar banking solutions because it can be used for both deposits and withdrawals, unlike some of the other intermediary payment services. In order to use InstaDebit, you need to first sign up with an account at its official website. You can register for free and initiate your first casino deposit with InstaDebit right away since there is no need to wait for your account to be activated or approved. Deposits with the method take place in real time. Players can use InstaDebit on condition they hold online banking accounts at one of its associated financial institutions in Canada. The transactions can be carried out in two currencies – USD and CAD. In its essence, iDebit functions in the same manner InstaDebit does, the only tangible difference being that one is not required to sign up in order to process their first roulette deposit at an online casino. You can check out as a guest and then register an account. The sign-up process is quick and hassle-free and you will not be charged a registration fee. The method offers increased levels of convenience, security and flexibility, and is supported by a large number of Canadian banks. You need to be an account holder with an associated financial institution to utilise it. Deposits are carried out immediately upon initiation after players complete several simple steps. They need to click on iDebit’s logo on their casino’s banking page to be redirected to the log-in page where they choose their bank, input the required information, and confirm the transaction. If you register, you will be able to withdraw as well as to deposit. The banking solution is hugely popular in Canada but can be used by players from several other countries as well, including Germany, Japan, the UK, and Sweden. The availability of withdrawals largely depends on one’s country. The method supports several widespread currencies, including CAD, EUR, USD, and GBP. Trustly was established back in 2008 and quickly gained traction among online roulette players thanks to the high levels of safety and the ease of use it offers. Similarly to iDebit, it enables you to transfer funds between accounts electronically while at the same time retaining your privacy. One of the strongest points of using Trustly is that there is no need to go through any registration whatsoever. The only condition you need to meet is to have a bank account at a supported bank and use its online banking services. The method is available to roulette enthusiasts from 29 European countries, such as the United Kingdom, Denmark, the Netherlands, Germany, Portugal, and Belgium. Trustly can be used in a variety of currencies, USD, EUR, and GBP included. Established in 2000, Citadel is a large-scale payment services provider. It supports a massive worldwide network spanning over 200 financial institutions, located in more than 30 countries. The method is praised for its flexibility as it allows for both online and mobile banking thanks to its free downloadable applications. You can download the iOS app straight from the Apple Store. Android users are recommended to head to the Google Play Store and download their free apps from there. Deposits with the method are carried out in real-time but withdrawals with this solution are not supported by all online casinos. We recommend you get in touch with your casino’s support team and enquire in advance whether or not you can initiate a cash-out with Citadel. Nordea enjoys a huge popularity among players residing in the Nordic countries. This financial service provider offers a broad range of products and services, online banking being only one of them. On top of that, Nordea is connected to several other large payment service networks, including the above-mentioned Trustly, MasterCard, and Euteller. Apart from issuing credit and debit cards, Nordea offers its customers an online banking service which goes under the name of Netbank. To use it, you need to have what are known as “access codes” which comprise your unique user ID along with your password, one-time security codes and confirmation codes. They make the online banking service all the more reliable, especially the one-time security codes since each of these can be used only a single time for a specific transaction. Nordea is largely used by Scandinavian players from Denmark, Sweden, Norway and Finland but is also available in several other jurisdictions such as Russia, Estonia, Latvia and Lithuania. Online banking poses as a convenient, efficient and dependable method when it comes to topping up your online casino account. Roulette players who choose to use it can feel safe in the knowledge their personal and banking details are well-protected and the transactions to and from their accounts are conducted in compliance with the highest safety standards. This type of payment solution is available worldwide, providing roulette fans from hundreds of countries with a trusted method to deposit money or withdraw their winnings. Now that we have introduced roulette players to how online banking works and what the most popular intermediaries are, we suggest they take a look at some of the virtual casinos we have reviewed on this page. All of the reviewed operators are legitimate, fair, and safe to play at. Most of them support online banking and work with the majority of the payment service processors we have mentioned above.